“Ohhh, you’re so lucky”, exclaimed my workmate when I told her that I was going to be spending my birthday weekend at The Lugger in Cornwall. 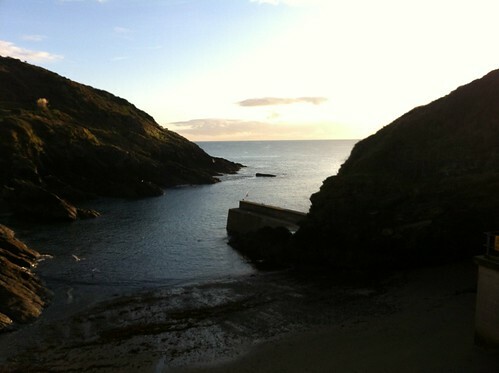 Being from Cornwall herself, she had once treated herself to a night a couple of years ago and loved it. Driving down the narrow country roads in pitch black, I only had the memories of images I’d seen on The Lugger website. Upon arrival I had to imagine the beautiful view that I would be waking up to in the morning. And when I woke at 8am, I wasn’t disappointed. Having not closed the shutters intentionally, I opened my eyes and watched the sea lolling, causing small waves to lap the shore. The room that we stayed in for two nights was quaint with low ceilings, white walls and New England style furnishings. A large desk / dressing table stood by the window and was surrounded by windowsills furnished with cushions, two bedside tables, an old alarm clock (which I had to hide under a large pillow due to the loud tick tocking) and a huge kingsize bed. The bathroom was equipped with a bath and drench shower. Breakfast on day one was pleasant but not a total success. Our freshly squeezed juices were just that – freshly squeezed and delicious. The mini pastries from the buffet table were the perfect sized treat before our hot breakfasts arrived. And the damson jam that I used to accompany the croissant was sensational. 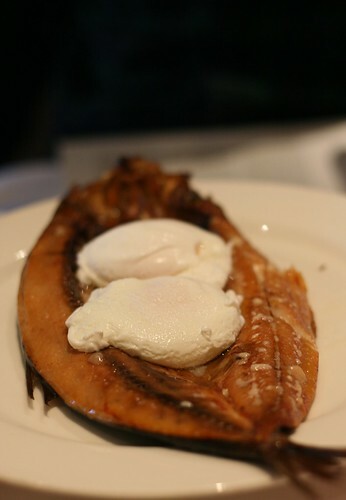 We ordered The Cornish Breakfast and Haddock with poached eggs. I’d never normally opt for Haddock for breakfast but since it’s freshly caught daily nearby I thought this was the best option. Both dishes were tasty but disaster struck with the poached eggs. 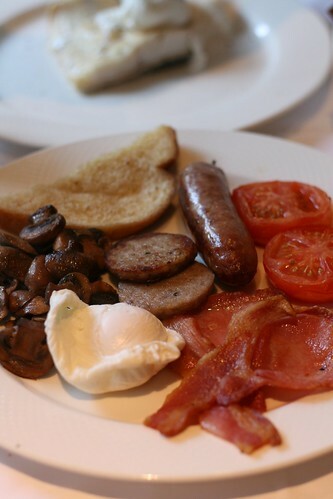 The quality of poached eggs in a breakfast can make or break the dish and unfortunately all three were overcooked. I’m happy to say that the same problem did not occur the next day. This time I ordered Kipper with parsley butter and grilled tomatoes. A slight mishap with the order meant that we received poached eggs instead of grilled tomatoes but they were quick to arrive when we asked. 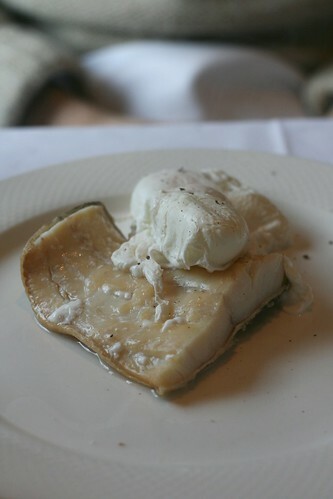 Despite the bones, which can be hard work with any whole fish, the kipper was an absolute delight and was by far the best breakfast I’ve had in a long time. 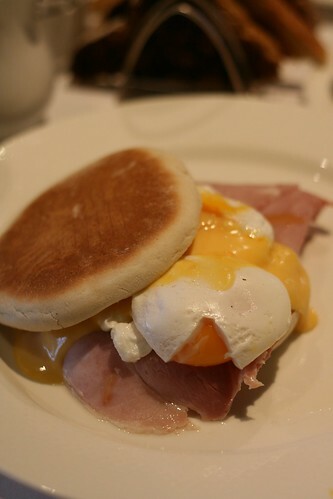 The eggs benedict was not nearly as special in comparison, although the runny egg yolks made up for it. Dinner at The Lugger is a whole different culinary experience. A few familiar faces from breakfast and three other couples, all guests at the hotel joined us in the small dining room. Due to the fact that the room is so small and there is no music, at times I felt slightly conscious that everyone could hear every word we were saying and speaking in hushed tones started to take its toll by the end. We ordered honey glazed pork belly, scallop and spiced carrot (£10.50) and Mussels ‘mariniere’ (£9) to start, followed by baked turbot, celeriac cream, spinach and potato gnocchi, glazed shallots and veal jus (£20.50) and West Country lamb fillet and breast, glazed Parisienne potatoes, pesto, dried tomato and olives (£20.50) with salt caramel parfait, cappuccino and praline sugar (£7.50) for dessert. The pork belly was beautifully presented. 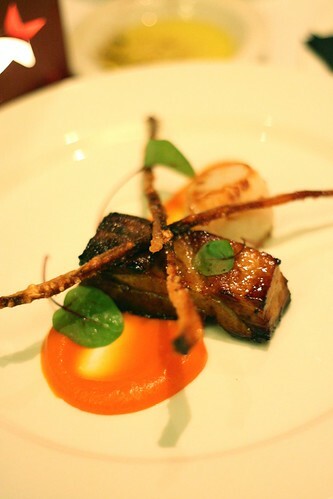 A small rectangle of tender and fatty pork belly lay on a bed of spiced carrot puree and was topped by two thin strips of crackling. The mussels, we both agreed, was one of the best dishes of our trip down. The sauce was creamy and herby with just the right balance of white wine to cut through. 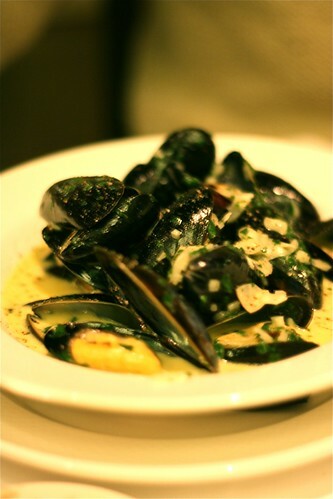 My only criticism was that there weren’t enough mussels in one bowl to satisfy two people’s cravings! The mains arrived and again the presentation was impressive. I loaded my fork with a morsel of each element of the baked turbot dish and my taste buds came alive. 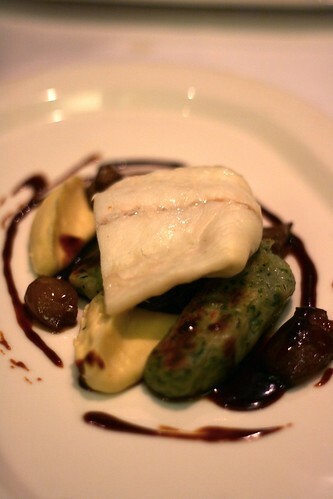 The intense flavours of the gnocchi and veal jus drowned out the turbot slightly but this did not matter. One little bit. I was in heaven. The lamb dish was yet another example of a fine main course. 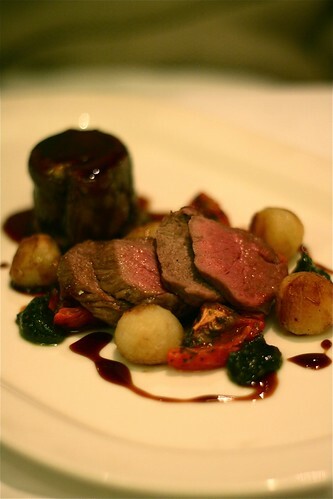 The fillet was cooked perfectly, pink inside and tender to the bite and the accompanying tomato, pesto and potatoes were perfect additions. I wouldn’t have known that olives were present in the dish had the menu not stated it and I’m not sure if the breast was needed – I would have been perfectly happy with another couple of slices of fillet but I am certainly not complaining. Too full for a dessert each, we asked for two spoons and shared the salt caramel parfait, cappuccino and praline sugar. The name of it confused me. Well, the cappuccino part. I had visions of a parfait arriving on the same plate as a mini cup filled to the brim with creamy cappuccino with praline sugar on the side. The waiter either didn’t seem too sure what I was asking him, or he didn’t know the answer but he assured me that the dessert did not come in the form of a cappuccino. The presentation was fantastic but I’m not sure this dessert did what it said on the tin. That’s not to say I didn’t like it, because I did. But I hardly detected any salt in the thin caramel layer on top of the parfait, which disappointed me ever so slightly because of my love for salt caramel. 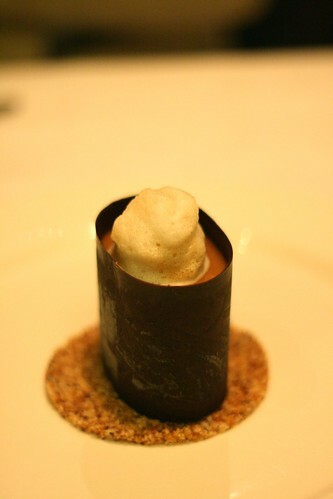 The cappuccino element of the dish came as a small dab of foam on top and was so slight that I only detected it in one mouthful. But it didn’t bother me because the smooth and cold dark chocolate that surrounded the parfait was delicious and the praline sugar was crunchy and sweet. Maybe the dessert just needs a change of name. The Lugger in the winter is cosy. Guests can sit by the log fire whilst drinking a glass of wine before or a coffee after dinner. And the surrounding area is perfect for the walkers out there, although it can get quite slippy up on the hills so I’d recommend taking shoes with a good grip. I’d love to go back to The Lugger in the summertime to enjoy more delicious food and to see more of the beautiful surrounding coast line with more hours of daylight. Food For Think was a guest at The Lugger. 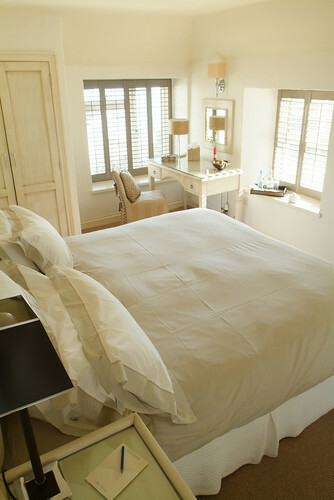 Rooms priced from £150 for two people – Rates quoted are per night for 2 sharing a room including bed, breakfast & VAT.